Few things can bring a community together like music, and this is even more true during the winter holiday season. The New School Chorus and The Mannes Community Orchestra are joining forces to do just that next week. Together, they’ll present an hour-long program of music to celebrate the end of the semester and the holiday season. You’ll hear music from the U.S, England, Italy, Russia, and more, and from a wide range of time periods and styles. The two large ensembles featured on this program are both initiatives of the continuing education arm of Mannes, Mannes NEXT. As such, they share the goal of providing a communal music-making experience for students, faculty, and staff from The New School, as well as musicians from our greater New York City community. 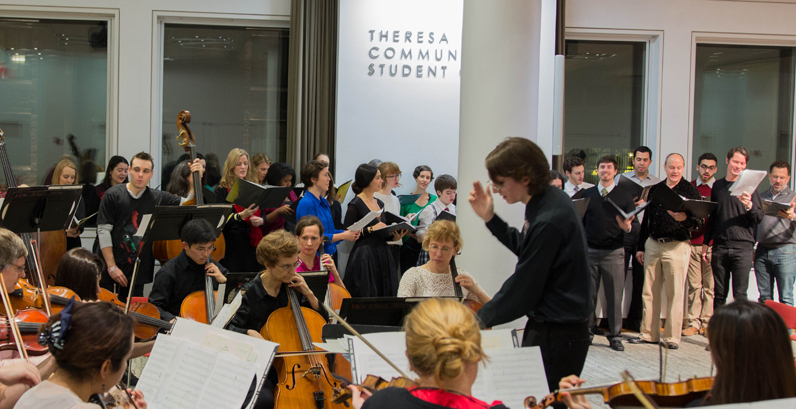 The Mannes Community Orchestra has a deep-rooted history, going back almost as long as Mannes’s near 100 year history. It has had many conductors over the years, and currently rotates a number of faculty conductors each year. This concert will be led by Mannes alumnus, Ben Ringer. In contrast, The New School Chorus is a very young ensemble, currently in its second year. Co-founded by Mannes Assistant Dean Kate Sheeran and co-directors Eric Dudley and Caroline Shaw (both members of the Grammy-Award vocal ensemble Roomful of Teeth), the chorus consists of over 90 members. For the holiday concert, The New School Chorus will be led by Eric Dudley. Throughout the hour-long “sing-in,” audience members will be invited to sing along to a number of familiar holiday tunes. Rounds and canons will be taught to everyone as well, in true communal music-making style. After the program, audience and performers can mingle over refreshments at a reception while enjoying the talents of a trio of students from The New School for Jazz and Contemporary Music. Join us for what is sure to be a delightful evening. Wednesday, December 10 at 6:30 p.m.